When I joined other locals and protested the opening of a gun store in Arlington, the owners of the store sued us, hoping to intimidate us into being silent. When we didn't back down, they dismissed the lawsuit because they knew that they would lose. Since many people cannot afford the time & counsel to defend against frivolous lawsuits like this (known as SLAPPs) I have introduced legislation prohibiting lawsuits intended to prevent people from exercising their constitutional right to protest. Currently, citizens of 49 States can re-elect their governor if the job is being done well. Virginia is the only exception, and I have proposed to change this rule. My amendment would only apply to governors elected after it goes into effect, giving no partisan benefit to the last few governors who were Democrats. Appointing authority for Board of Directors of Washington Metropolitan Area Transit Authority. Changes from the U.S. Administrator of General Services to the Secretary of the U.S. Department of Transportation the appointing authority for the two federal members of the Board of Directors of the Authority and their alternates. The change is made in the WMATA Compact found in Title 33.2 of the Code of Virginia in order to conform with federal law. 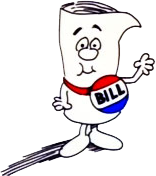 The bill contains an emergency clause.